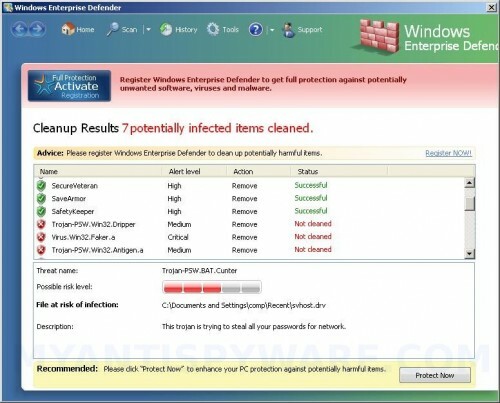 Windows Enterprise Defender is a new rogue antispyware program. 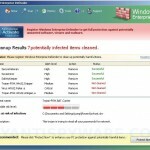 It is a clone of another rogue antispyware application called Virus Doctor. When the rogue is installed it will be set to start automatically when Windows loads. Also Windows Enterprise Defender will create numerous files with random names that are made to appear as infections, but are in reality harmless. Immediately after launch, Windows Enterprise Defender will begin to scan your computer and list previously created files as infections to trick you to buy the paid version of the software. All of these infections are fake, so you can safely ignore them. However, all of these alerts are a fake and like scan false results should be ignored. If your computer infected with Windows Enterprise Defender, then use these free instructions below to remove Windows Enterprise Defender and any associated malware from your computer. Select Perform Quick Scan, then click Scan, it will start scanning your computer for Windows Enterprise Defender infection. This procedure can take some time, so please be patient. Make sure that everything is checked, and click Remove Selected for start Windows Enterprise Defender removal process. When disinfection is completed, a log will open in Notepad and you may be prompted to Restart. Try these steps: Malwarebytes won`t install, run or update – How to fix it. Also you can ask for help in our Spyware removal forum. I am totally computer challenged but I knew that this Windows Enterprise Defender is for the purpose of buying their program. But I don’t understand how to download the Malwarebytes Anti Malware; where do you get it from? Is it also bad? Please instruct someone who is computer programming install/uninstall challenged. Amparo, open these instructions how to use Malwarebytes Anti-malware and scroll down to download direct link. I believe I got this virus while searching EBAY for converter antennas. It is nasty, and I have not been able to get rid of it. It got through my Panda Global Security, and manages to disable Panda from running. I have run MalwareBytes Anti-malware four times, and as soon as I reboot the PC, it comes right back. I am running XP, SP3. When I tried to restore the system from old data, it says there have been no changes in the system, so there is nothing to restore. That tool has always fixed the problems I have had before. Does anybody have any suggestions before I have to format and start over?? Syrl, ask for help in our Spyware removal forum. Gentle Giant, make a new topic in our Spyware removal forum. I have gotten this far, but still not done!!! Steve, ask for help in our Spyware removal forum.